When my wife and I were first married we didn’t let our firstborn son play with guns. So, instead, he’d make them out of legos, tinker toys, or whatever we could get ahold of. Now that we have five kids, we don’t even think about it. In fact, we’ve learned it can be a lot of fun. Toddlers and young boys just gravitate towards Super Soakers and Nerf guns. So, if you’re looking for a good Nerf gun, which one should you get? Here are a few things to consider. 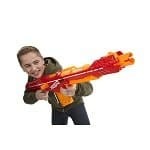 Lightweight Nerf guns are easier for small kids to handle. Young children may have a difficult time carrying the heavier automatic options. Guns that are easy to load are ideal. If your kids can’t load it, then you have to do it. Aftermarket darts are cheaper but often times have heavier and harder tips. This is fun for adults as it helps them go further, but probably not the best idea for a toddler or young child. Buy extra darts. Our kids tend to lose, chew on, or find some way of destroying them regularly. If you’ve never purchased a Nerf gun before or don’t do it regularly, it’s hard to know exactly what you’re getting into. For simplicity’s sake, I’d first recommend you go with a Nerf gun from the Elite series. All of these guns use the same darts interchangeably. Then when you have your Nerf Wars, you can just trade them out. Here are few of the options I’d personally go with if you’re buying for a young kid or toddler. The great news is 2019 has brought some fun new options, including blasters from the very popular video game series Fortnite. The Nerf MicroShot is our recommended choice for the best Nerf Blaster for a 4-year-old. This gun has so many new configurations that no matter what character or movie your child likes, there a is a blaster your child will love. I’m a little partial to the Star Wars guns, but my 9-year-old son prefers the new Fortnite and Marvel MicroShot guns. These guns are really simple to load and have a simple trigger mechanism that allows kids to run around and chase each other. MicroShot comes in over 10 different styles. The Fortnite varieties are available March 22 of 2019. 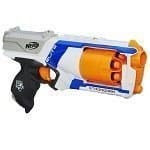 Most kids will prefer to have another Nerf blaster as their main gun, but the MicroShot makes a great backup. This is also stores well in a belt or a tactical vest. 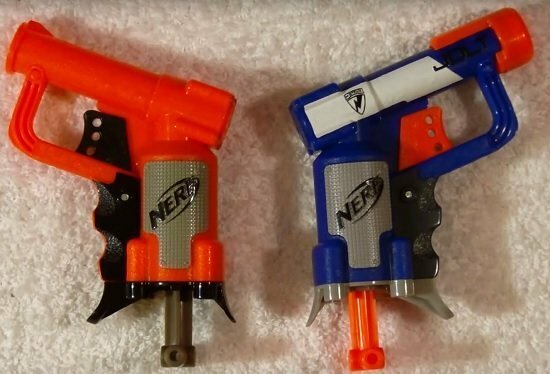 These blasters fire just one dart at a time and use the elite darts, or in other words fires a basic shot. They weigh less than half a pound each so even a toddler can use it. 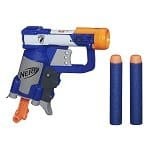 If you’re searching for a good Nerf gun for your toddler, this is the one I’d go for. It’s compact and only shoots one elite dart at a time. It’s easy for a 5 or 6-year-old kid to operate and even my toddler can do it (although she has a little trouble with pulling the handle down). 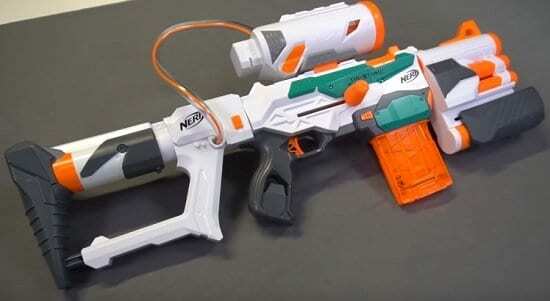 Even though it looks pretty small, this gun fires the elite Nerf darts at a rate of around 50 to 55 feet per second. So, like all Nerf guns, you need to be sure that your young kids are careful or wear appropriate eyewear. You’ll notice in the picture that there are two jolts. The less colorful option is the older one but is often available for less money. The newer option does look more substantial with its larger plastic barrel and colors; however, performance is pretty much the same. The difference between the two is around $3. So, you’ll have to decide whether you think it’s worth it or not. 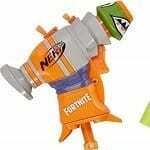 Clear green and clear orange options are also available for the Jolt Blaster. Don’t let its size fool you–the Elite Triad EX-3 is powerful, easy-to-load, and very capable of firing a lot of darts each minute. Even though it’s almost as compact as the Jolt, the Ex-3 has 3 bullets rather than one. The gun needs to be cocked each time you fire, even if all three darts are loaded. Still, it’s great as your retaliation weapon. 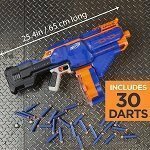 Like any of the Nerf guns, you need to be a bit careful with this one as the darts can go up to 90 feet at up to 72 feet per second! They can hurt small children if they’re less than 10 feet away so be sure to set some ground rules and supervise your children while using it. If your child is constantly shooting her siblings, I suggest setting up a target on the wall. Otherwise, you’ll certainly have some crying from younger siblings. You may notice in the picture of the two different designs. The right one is the original while the Elite version is the newer model. Like the Jolt, there’s no difference other than the colors. So, go with whatever is cheaper or has the color scheme that you prefer. 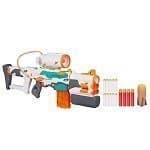 The Strongarm Blaster is definitely one of my favorites for young kids. 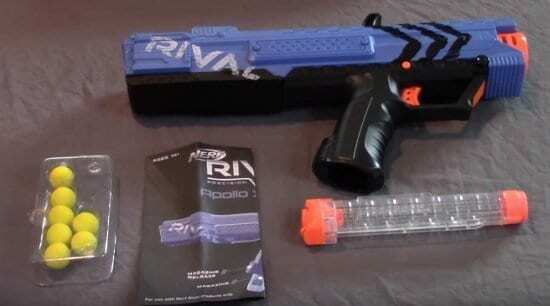 It allows you to pump the strong arm while holding down the trigger to fire out all 6 elite darts. Unlike the Triad EX-3 the barrel rotates on this one and it even flips out to make it easy to load. In terms of accuracy and power, it’s pretty good as well. I wouldn’t put it as accurate as the two options above; however, it’s still really good. For power, the darts go up to 90 feet. For kids, this is a good one. My toddler can load it and fire without a problem. Overall, it’s a good option for kids and nearly as cheap as the options above, which is definitely a plus for our big family. I really like the Elite Bow that Nerf makes because they’re so easy to use. In order to use it, you just load 15 darts into the clip, pull back the string, and then as you release it fires and the clip moves upward. So, there’s no balancing anything on a string which a toddler or even 5 to 6 year old might find hard to do. Plus this design is a bow which many smaller kids really like. In terms of power, this one goes about 65 feet per second on average. That’s not quite as powerful as the 70 feet per second that most of the elite line does, but still good enough to shoot pretty well. The power difference might even be a plus for some. Overall, this is a great little bow and one of the only ones I’d recommend. For around $20, it’s a good value overall. 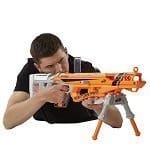 The Infinus Nerf N-Strike Elite Motorized Blaster is a larger gun that comes with a 30 dart drum that can be emptied within seconds. It’s a little bit heavier than other options I’ve included here but it’s easy to fill up and super easy to shoot as it runs on batteries. As it is heavy, I wouldn’t recommend it for anyone younger than 6. Whether or not you want to deal with batteries is up to you. However, for my little kids, it makes it easier to shoot as they don’t have to pull the trigger. The auto-loading feature is amazingly easy just stick the dart in the hopper and it auto-loads. 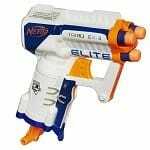 Overall, the Infinus Nerf N-Strike Elite Motorized Blaster is one of my favorite motorized Nerf guns. it’s a bit costlier than other options on this list, but more substantial as well. 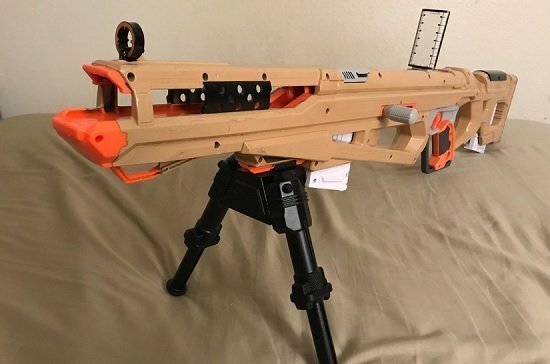 The Elite AccuStrike RaptorStrike has a unique design that has a pop up site and extendable bipod. This is a lot of fun for your 5 or 6-year-old, but might be a little complicated for really young kids. For capacity, the RaptorStrike uses 2 clips of 6 elite darts that can be reloaded quickly into the clip. Overall, this one is fun but not quite as reliable as some of the more basic guns. If you get it, it’s more for the novelty of being able to move mount your gun. For distance, it goes up to 80 feet. If you get this gone, also be sure to purchase the 18 round dart clip for even more rounds. Capable of firing 18 darts in 6 seconds, the Rapidstrike is capable of taking down your foes within a matter of seconds. The acceleration trigger powers up the motor and then you just let it go. The bullets for me in particular fire up to 60 feet. The great part about quickfire is that even when your opponent is dodging you can actively move the darts. On the other hand, rapid fire isn’t always the greatest thing for little kids. When they’re done firing they’ll be chasing you down to either fill it back up or taking a long time doing it themselves. Still, my kids scream in excitement every time they pull the trigger on the Rapidstrike. Like the option above this one is motorized and therefore requires batteries that are not included. So, be sure to get 4 C size batteries along with your purchase. If you’d prefer to aim for a target and have accuracy rather than speed, the Mega Centurion N-Strike is one of the best options out there. It comes with 6 mega darts, different than all of the other options so far which use elite darts, that fly up to 100 feet! In addition, this model comes with a bipod for additional stability. Another fun thing about the Centurion is that as you fire the darts scream. It is large, so it’s fairly difficult to store, and in my opinion, could have been made smaller. 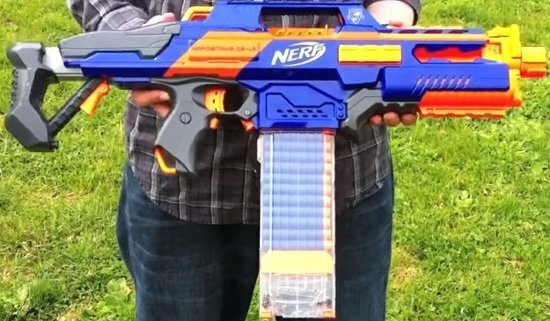 Overall, this Mega Nerf gun is a little fun and fantastic if you know what you’re getting. It’s not a rapid fire gun so don’t expect that. 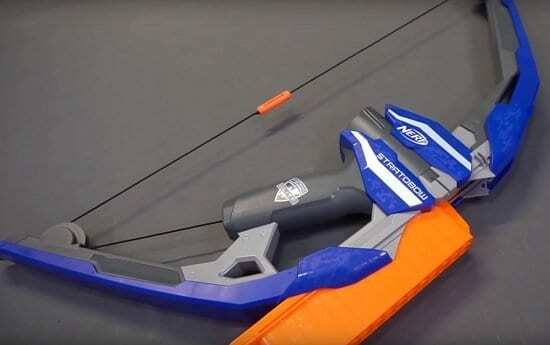 However, if you want a sniper rifle type Nerf Gun, this is it. 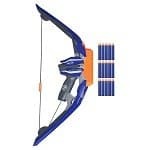 If you’re a bit more serious about your Nerf gun collecting or you simply want a gun that shoots a few different types of darts, I really like the Nerf Modulus Tri-Strike. It shoots 3 different types of darts which is super fun as you change from trigger to trigger. 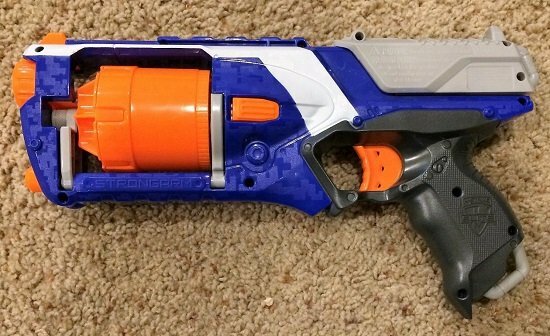 The gun itself is easy to mod with a variety of other Nerf parts or simply the included parts. The core blaster is a lot like the old Longstrike from back in the day. Darts are placed in a magazine and stuck darts are removed from the access door above. However, this one doesn’t get jammed often and especially if you don’t use damage bolts. As this model is a bit more complicated, here’s some more information about exactly what you’re getting. For the main blaster, it goes pretty fast at around 65 feet per second. The mega blaster is, admittedly slow but still fun. 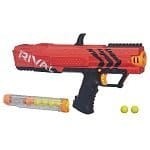 If you’d prefer something different to darts, I like the foam balls of the Nerf Rival Apollo. It comes with a magazine that advertises 7 balls but for many will hold up to 8. Admittedly, the Apollo is a bit difficult to prime before you shoot. However, it’s a lot faster than your regular velocity, at around 100 feet per second. So, you’re hitting your opponent who has a Nerf gun faster than they can hit you. 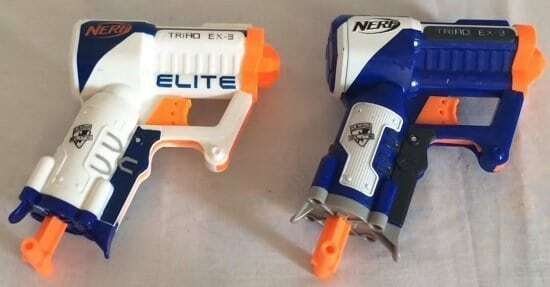 The balls for the Apollo are a bit more expensive than your standard elite dart and the gun is a little bit harder to load, but it’s still a lot of fun for kids. Girls love Nerf Guns too! Trust me, there are three of them in our household. 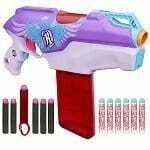 For that, try the Nerf Rebelle line which has a ton of great options that shoot accurately and quickly. Of these, I’d recommend the Rebelle Rapid for your young kids. 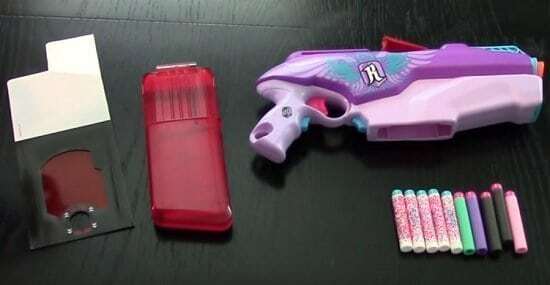 It takes up to 12-darts through a clip and has an acceleration button for motorized blasting. For the motor, it takes AA batteries. It comes with 6 standard darts and 6 message darts which you can write and use a decoder to send a secret message. I’d like to say that this gun is as efficient as the standard options, but it’s not quite there. That being said it’s still very good and my daughter loves it because of the colors. 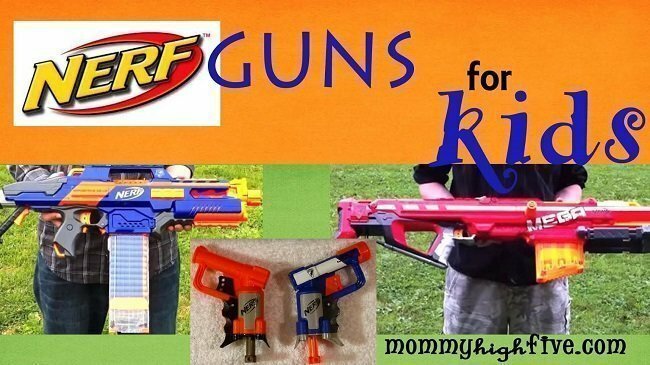 Overall, you need to use your judgment to determine which Nerf gun would be good for your young children. 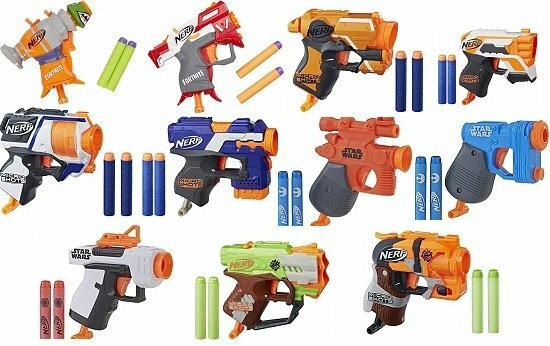 Some of the Mega Nerf or Rival options above might be age appropriate for your child at 5 or 6 but not for another child. That being said, Nerf Wars are a fun family activity when everyone, including your small kids, can participate. Let me know below, what Nerf blasters you like to use with your kids and don’t forget to take our interactive poll to see what others like.